Dometic | Ocean Options, Inc. 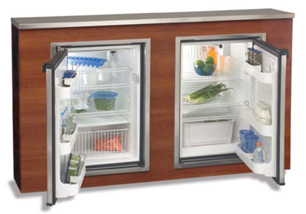 Designed for the rigors of marine use, the CR Series provides built-in refrigerators for every application. 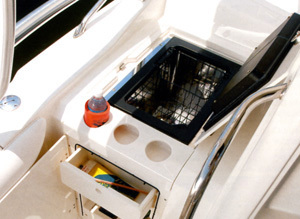 Each unit includes a flush-mount frame that will compliment any on-board galley or cockpit. Dometic's TJ Series of refrigerators and freezers are now available with a stainless -steel finish. These state-of-the-art units are desinged to replace existing refrigerators and give your galley a more modern look. For more information or to purchase this product, please contact us. Crushed ice - preferred by fishermen, cools more quickly and packs better. Ice is produced continuously and pumped from a remote location to nearly any desired location whether it be to a fish box, drink box, or coolers. 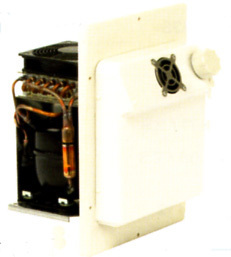 Easy to install units are designed to be mounted below deck and protected from salt spray. Eskimo Ice Units can produce up to 600 pounds of ice a day, up to 25 pounds per hour, with discharge hose lenghts up to 35 feet under normal operating conditions. The CB Series top loading refrigerators and freezers are space saving built-ins and can be set to operate as either a refrigerator or a freezer. The lid can accommodate laminate to match countertops and they are ideal for use as a bait freezer or refrigerator. 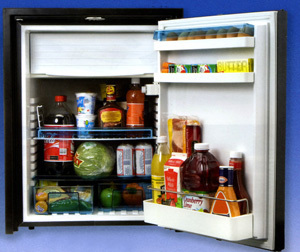 The CF Series of Portable Refrigerators can be set to operate as either a refrigerator or freezer. The quick chill/turbo function runs the compressor at maximum performance until the desired temperature has been reached and the memory feature will maintain preset settings if the system is turned off. It comes with a three-stage battery monitor with low voltage shut-off to protect against a dead battery. 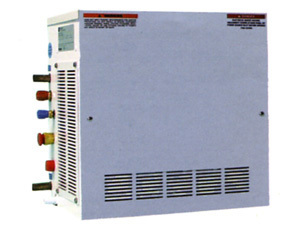 The KRA Series Cabinet Condensing Units are for use in your refrigeration and freezer systems such as cockpit refreigerators/freezers or catch-box chillers, built-in galley refrigerators/freezers, or small walk-in coolers. The condensing unit works in conjunction with evaporator plates installed in an insulated box, or a box wrapped with evaporator tubing. Box temperatures between -5°F and 40°F can be achieved with proper application. 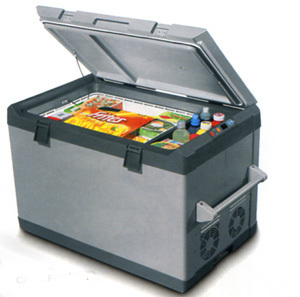 The CD Series Drawer Refrigerators provide cooling comfort for confined spaces. This smart compressor appliance turns any unused nook into a practical 31 quart cooler and offers a continually variable thermostat that will not accidentally freeze items. Dometic's line of refrigerators and freezers are available in black and stainless-steel finishes and all models offer a number of refinements and improvements in the door and latch assembly. The door and shelving systems are exceptionally strong and the latch system has been designed to withstand extraordinarily rough treatment and to resist accidental opening. These smart looking units are designed to replace existing refrigerators and give your galley a more modern look. The CS-NC-15 Cooling Kit is ideal for converting an existing, passive, insulated cooling area into a full, compressor-power refrigerator. It can be mounted in either a vertical layout or wall mount and under normal refrigeration cools up to 8.8 cubic feet, 2.5 cubic feet for deep-freezing applications. 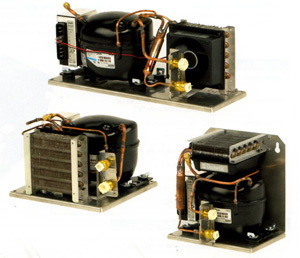 The do-it-yourself Coolmatic Series cooling kits are custom made cooling solutions for all applications. They are designed for small and medium refrigerator capacities and for use in warmer water. It is equipped with a power-regulated Danfoss BD35F compressor and has 3 air-cooled units of different body shapes. Copyright 2010 - Ocean Options, Inc.